Posted on June 26, 2015 at 11:30 pm. 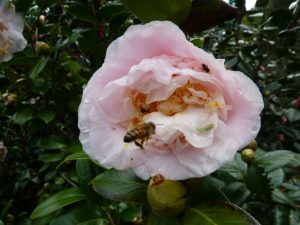 We are well into camellia season – so we are open again this weekend – Saturday and Sunday – 8.00am till 3.00 pm. We have mostly small pots, 140mm, with plants 30 to 90cm tall. About 200 different varieties – if anything that makes the selection process harder – lots to choose from. But no one complains – they just love the variety – ones you don’t see every day. So come in, walk the garden, pick your favs, and buy yours this weekend. 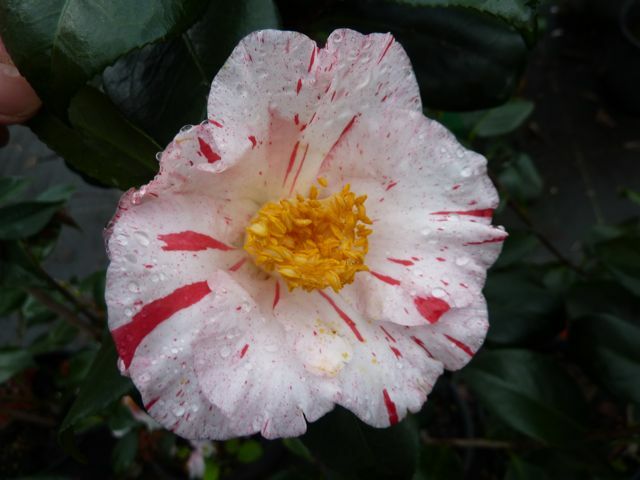 Sasanquas – the sun camellias – are just about finished flowering, but we are still selling plenty. Singles, semi doubles, whites through pinks to red and some bi-colours. Useful for hedging, screening, specimen plants or just have them in the garden. These evergreens make a wonderful garden plant all year. But it is the time of the japonicas now – hundreds of flowers out right now. These prefer part shade in this part of the country and love high shade from trees. Again ranging from singles, semi-double, formal double, informal double and elegans form and colours from the purest whites, blush, peachy pinks through to reds and some edging into the purples – if the soil and weather suit. Then there’s striped, variegated, bi-coloured, edged and more. This is a great time to plant, while the plants are in their winter dormancy. See the ‘culture notes’ on this web site for more detailed information. The Queensland Camellia Society has its annual show and sale at the Mt Coot-tha Botanic Gardens auditorium on Sunday 5 July – there will be bloom displays, information, camellia talks and plants to buy. 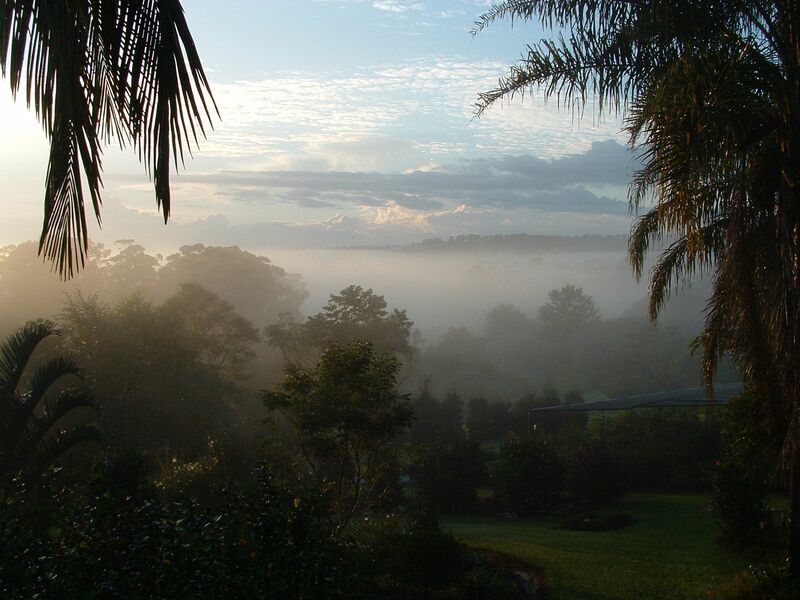 Friday, Saturday and Sunday 10, 11 and 12 July is the best sub tropical garden show in the country – Queensland Garden expo, at the Nambour Showgrounds – Sunshine Coast. Too good to miss – and we will be there. Get into the garden this weekend. Cheers. 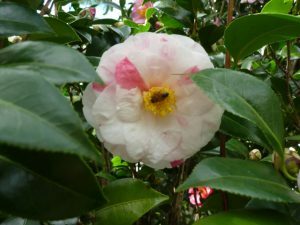 Camellias – they are flowering! Posted on February 24, 2013 at 2:44 pm. What a summer we have had here! 2012, in July, August, September and October we had 21mm of rain. November 72mm and in December just 31mm. This was certainly the longest dry we have experienced here on the Sunshine Coast in the 14 years we have been here. Water for nursery plants was ok but we were not able to keep sufficient to the 400 or so plants in the gardens. The ones under part shade fared well enough, but others dropped leaves, looked poor and failed to put on any new spring and summer growth. This was of some concern when we started taking cuttings in December – many plants did not have quality material for cuttings and as a result, we will be short of some varieties in 2014. Then it rained and blew as the tail end of cyclone Oswald came down the coast – from 24 January we had at least 500mm in 5 days and so far in February (it’s 24th today) we have had another 270mm. We are expecting more today if the reports turn true. So, where we had dry brown grass, now we can’t mow it quickly enough – plants that had dropped leaves are putting on new growth – somewhat unseasonally – but the plants will do what they need to do at the right time for them. The early sasanquas, particularly Mikuni-ko, are flowering with spot flowers on Bonanza, Sparkling Burgundy and flower buds are sucking up that moisture ready to burst out over the coming weeks. Japonicas that failed to put on new spring growth are now showing 20 and 30cm of new growth – and budding up on the old wood at the same time. With this amount of moisture in the ground now, we should have a good showing over the next 6 months. During the ‘ex-cyclone’ event, we lost power for 3 days. Apart from some inconvenience in the home, our concern was that the cuttings we had taken in December were not getting the constant misting that give them the best chance of callousing and putting on roots. Whereas we have had some leaf drop, we are hopefully confident that out strike rate will pick up. 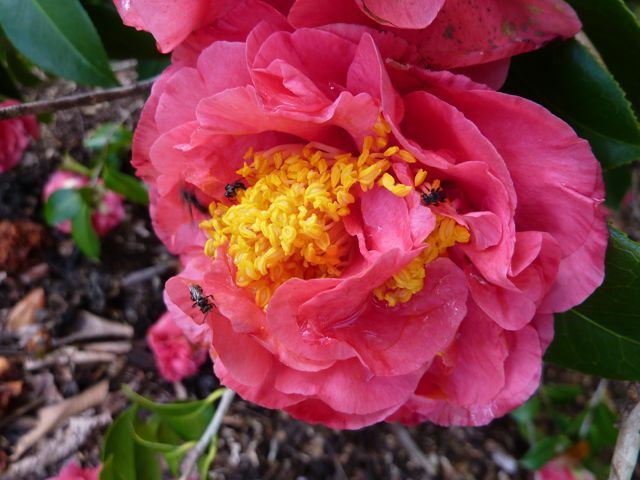 As we start the flowering season, we have had many gardeners calling in to purchase camellias for their gardens. We will start our open days over the weekend 13 and 14 April and then each weekend in April. We will also open in May, June and July. Watch this for dates. 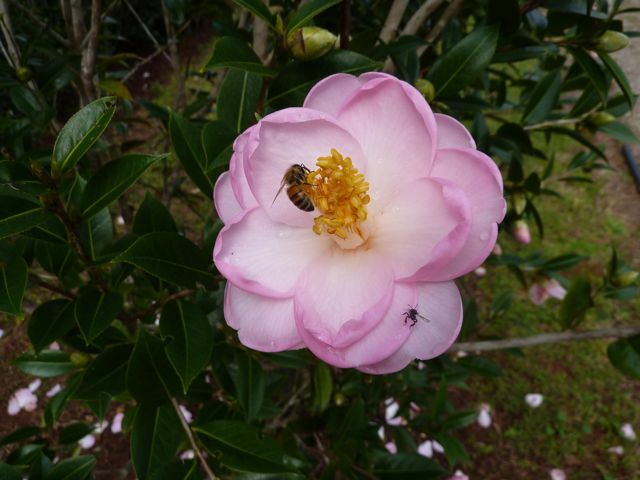 30 June – Queensland Camellia Society display – Mt Coot-tha Botanical Gardens – Randall Studio. We will have plants to sell. We are also happy to do mail order for those who cannot visit us – east coast Australia at this stage. Email us..
Posted on June 29, 2012 at 10:27 pm. We have had a week of wet – 5 inches or 125mm of rain – and cold – one day a minimum of 15 and max 17 degrees. 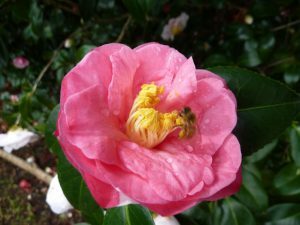 But today was fine and sunny – even warm, and a walk in the garden in the middle of the day proved the value of camellias in the garden for bees. There were hundreds of them in all flowers with those lovely yellow stamens. The lutchuensis bushes were a-buzz with dozens of bees in each one. There were honey bees and a couple of different native bees. Get out into the garden and enjoy..
We are open to the public this Saturday 30 June. Come and see us at the Queensland Garden Expo at Nambour Show Grounds – 6, 7 and 8 July – best garden show there is…. Posted on July 4, 2011 at 10:45 pm. 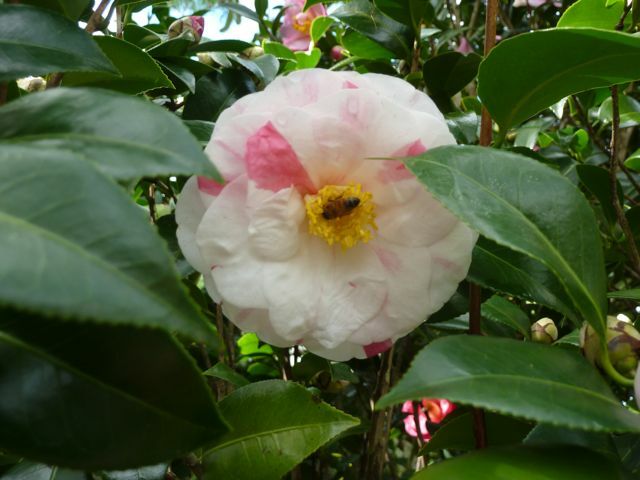 Although we will probably not have every variety that we grow at the show, we will have about 120 varieties of camellia sasanqua, japonica, hybrids and species. We will also have a range of Vireya rhododendron. Come and see us there. Each day 8.00 am to 3.00 pm. No EFTPOS. Posted on July 1, 2011 at 10:17 pm. Just a quick reminder – the nursery will be open to the public this weekend – 2 & 3 July from 8am-3pm. After a little bit of rain recently the garden is refreshed and the blooms are beautiful – worth a wander. 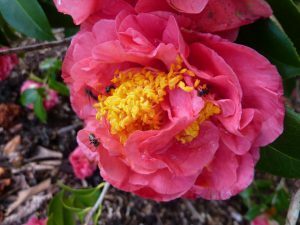 We have arguably the most extensive range of camellia varieties in South East Queensland and we have hundreds of plants in stock. Check the variety list on the website – not all varieties are available at this stage in the season. As well as that we have a plant stall at ‘Camellia House’ – part of the Australian Open Garden Scheme – at 116 Palmwoods/Woombye Road, Palmwoods, open 10am-4.30pm Saturday and Sunday, 2 & 3 July 2011.